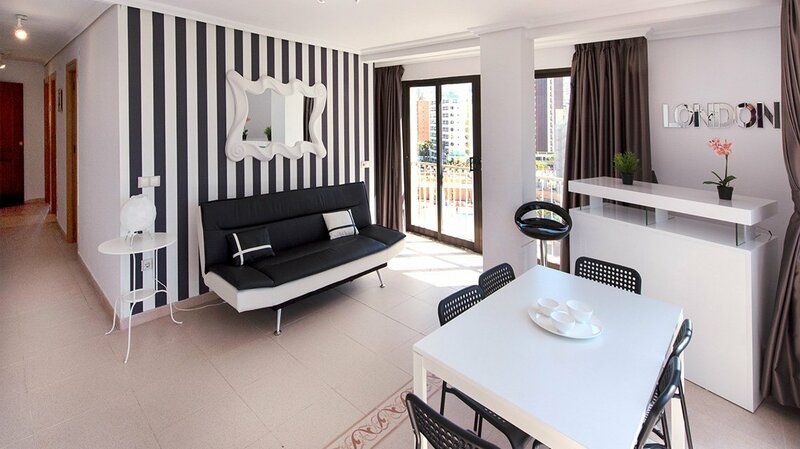 From its elegantly styled black and white themed lounge and dining area to its beautifully designed bathroom that inspires relaxation, this, another in the line of exquisite holiday apartments Benidorm from My Pretty Payma, is designed to deliver unforgettable vacation memories. 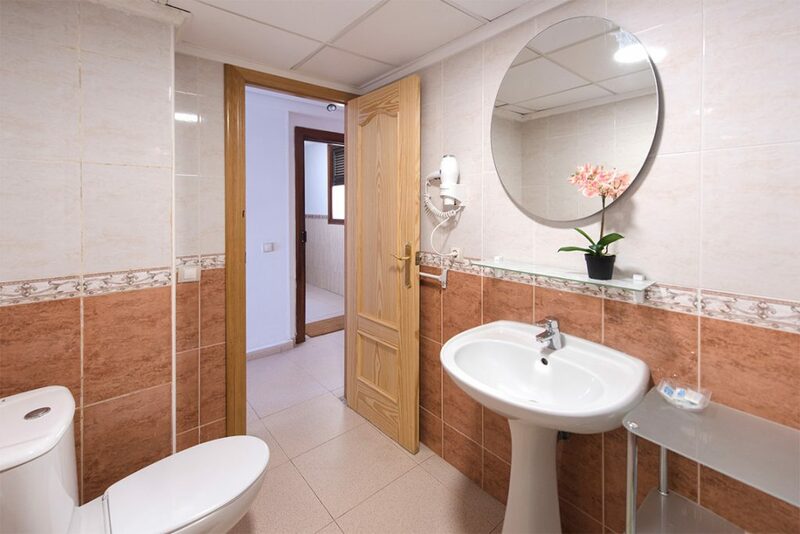 Take your Benidorm vacation to the next level with this brilliantly designed two-bedroom apartment unit, complete with living/dining area, fitted kitchen and a beautiful bathroom. The premium design and décor of this two bedroom unit creates an overall luxurious ambiance that delights the senses. 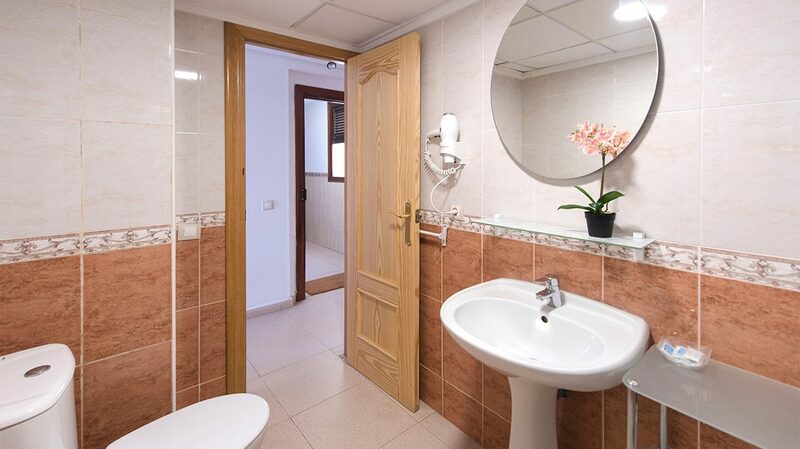 The standout décor of each room adds uniqueness to that individual space while working together brilliantly to deliver the overall results. The alluring black and white décor of the living and dining area is a mark of taste and elegance. One wall is highlighted in the lovely floor to ceiling black and white stripes, accented by an eye-catching mirror hanging perfectly over the beautiful black and white sofa. 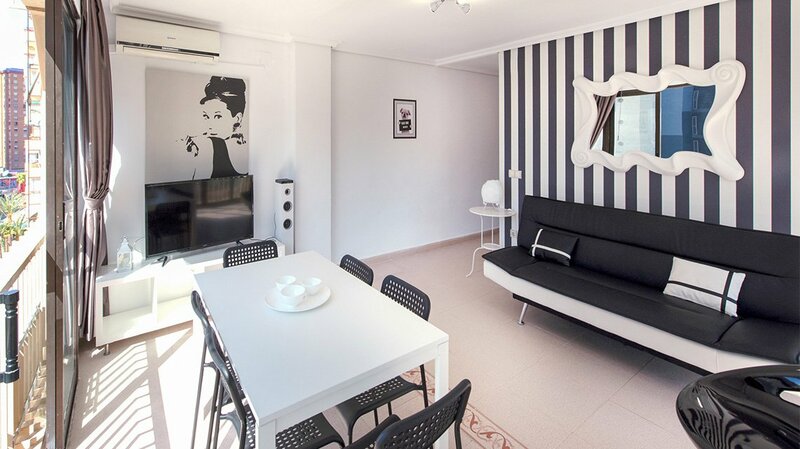 The black and white theme continues with the stylish corner bar area, the dining table set, Hi-Fi equipment and wall hanging set over the flat screen television. 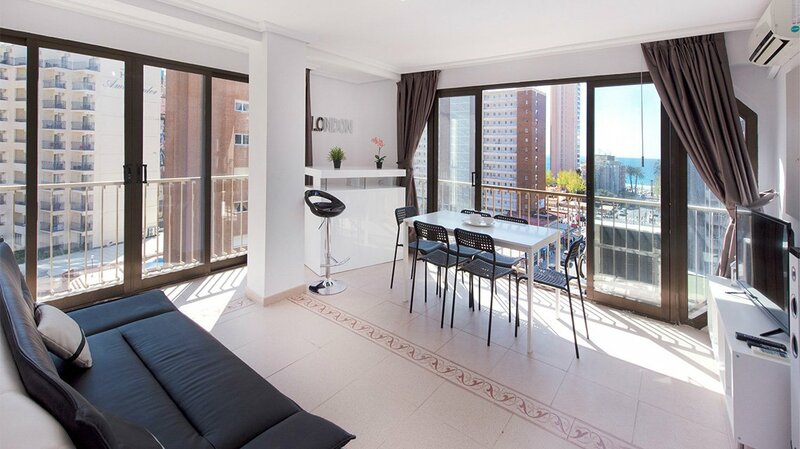 The layout and set up of the room is impeccable with the sliding glass doors to the front and side providing a lovely view of the stunning Benidorm coastline. 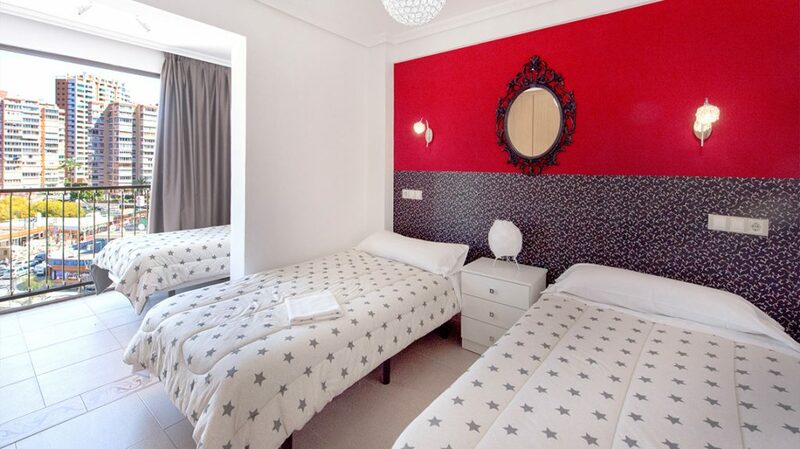 There’s no mistaking the intent to ensure guests sleep like a king while vacationing at our holiday apartments. The spacious, well-kept bedrooms bear a simple yet elegantly striking décor. Backdrop walls in each room are tastefully done in a finish that adds delightful contrast to the room. 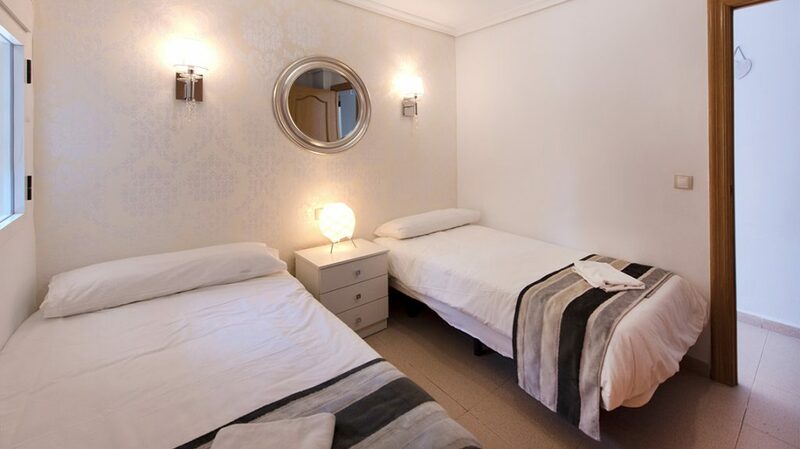 The bedrooms carry a total of five beds, including an alcove area with a single bed. The bathroom walls through to the shower bear a beautiful floor to ceiling wall tile finish that gives a clean, elegant ambiance. A hair blower is provided. 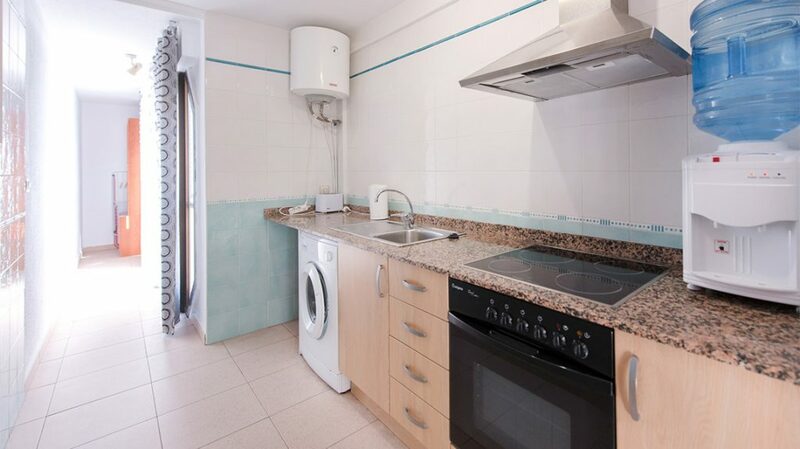 All My Pretty Payma self-catering apartments come complete with a kitchen fitted with all the necessities to make your Spain vacation a memorable one. 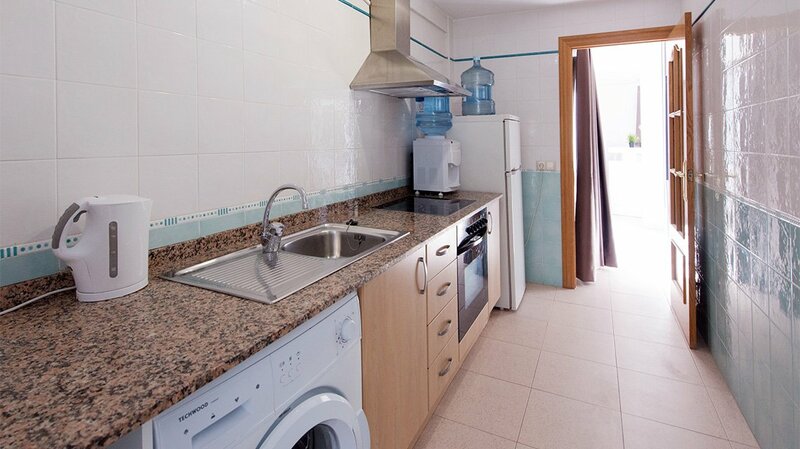 Here we have a full-size fridge/freezer, oven/hob, kettle, coffee machine, tabletop water dispenser and washing machine. The granite countertop adds a sleek look.